What Are The Dimensions of a Wrestling Mat? The dimensions of a wrestling mat will vary depending on the level of the wrestlers involved. There are different mat requirements for high school, college and international wrestling. Mat requirements pertain to the minimum dimensions and many schools will use larger mats than are required. The National Federation of State High School Associations rules state that a high school wrestling mat must be a minimum of 38 feet on each side. This will accommodate the 10-foot inner circle, the 28-foot wrestling area circle, as well as allow for the minimum 5-foot safety area surrounding the wrestling area. The 38-foot mat size is the minimum size required and Resilite Sports Products, one of the largest mat manufacturers, states that most high schools will order a mat that is 40 feet on each side, which will yield a 30-foot wrestling area. The National Collegiate Athletics Association requires a larger wrestling area than is used by high school wrestlers, which leads to a slightly larger mat. College wrestlers must have a minimum of a 32-foot wrestling area, which requires a mat that is at least 42 feet on each side. Colleges may have up to a 42-foot wrestling area and there must be at least a 5-foot safety zone that surrounds the wrestling area. International Federation of Associated Wrestling Styles used two distinct styles of mats. The first is the traditional square mat, which is required to be 12 meters, or 39.36 feet, on each side. This allows for a 7-meter wrestling area, which is just under 23 feet in diameter, as well as a 1.5-meter, or 4.92-foot, protection zone. 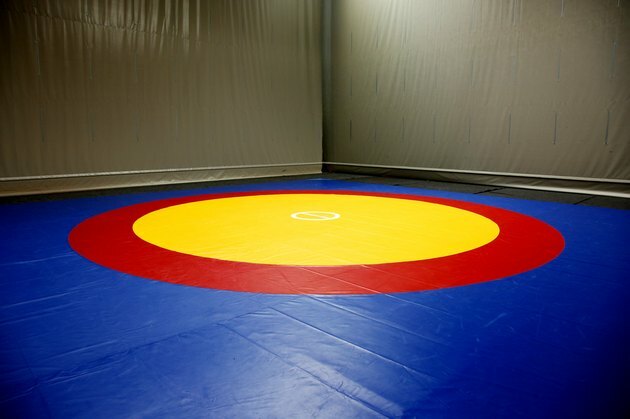 FILA also uses an octagon-shaped mat and those mats should be 15 meters, or 49.21 feet, in diameter. Due to the cost of regulation-sized mats and the space requirements, many people will buy smaller mats for home use or practice. The most common sized mats for home use are 10 or 12 feet per side. School practice mats can range from 20 feet per side up to 32 feet per side. Anything larger than a 32-foot practice mat is closing in on a regulation-sized wrestling mat. Custom-made mats will tend to shrink slightly while being made, which is something that should be considered by those trying to buy a custom mat ti fill a particular space. Which Side Is the Right Side of a Yoga Mat?